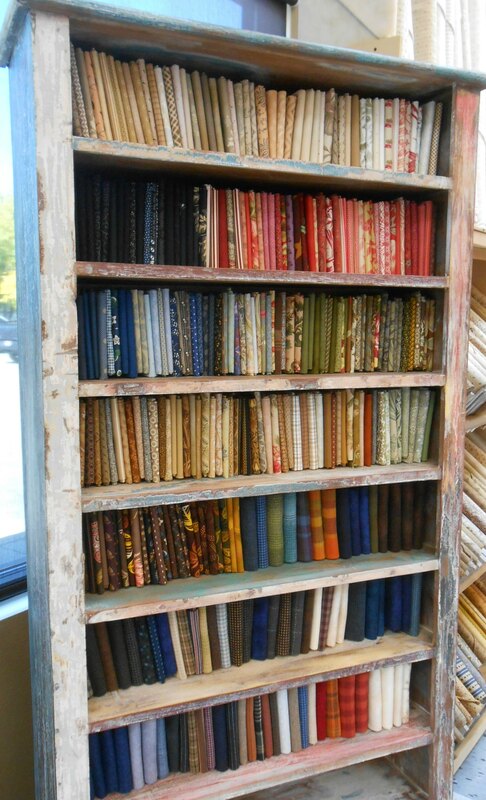 If you visit Quilt Expressions for either our monthly Stashbuster meetings or to attend our “Everything Series” events, you’ll likely recognize this part of the store. It’s big enough to hold over 50 chairs. But right now? It’s our temporary holding space for the results of Karen’s furniture shopping trip. It’s like Christmas in October! If I could manage to sneak some of the pieces past my husband and succeed in convincing him that they’d been in our home all along, a few of these would never make it on to the floor. 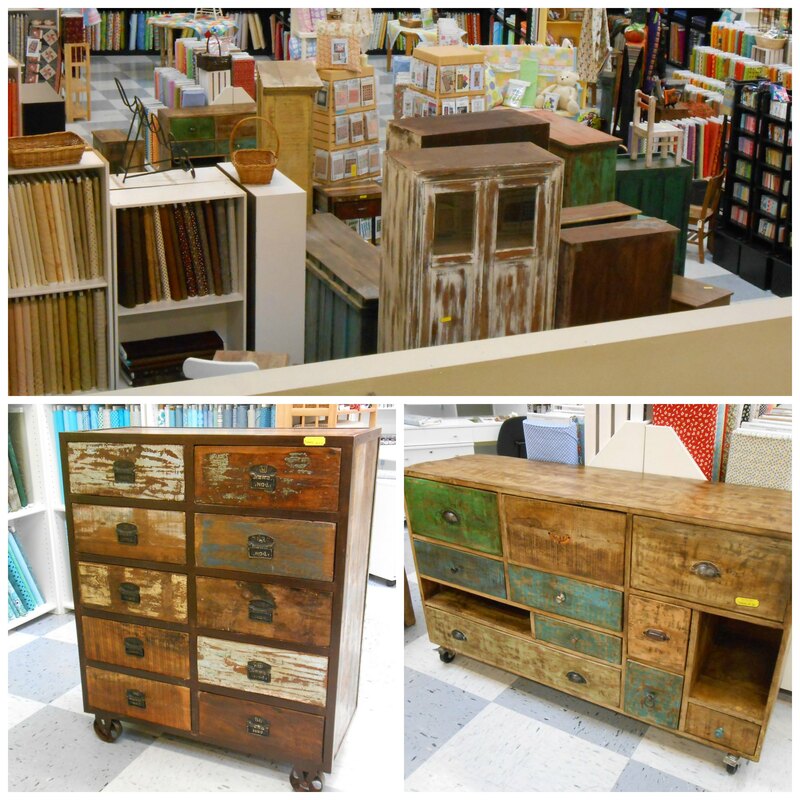 I love furniture with personality…something you’re not going to see in your neighbor’s house, too. And, as always, Karen didn’t just buy furniture. There are a few other bits of eye-candy to enjoy. I’m lucky enough to get to help make some of the displays in the store. It is so nice to have unique pieces of furniture to incorporate into our displays. Karen’s shopping trip yielded two of these bookcases; they didn’t sit empty for long. Perfect storage for fat quarters! 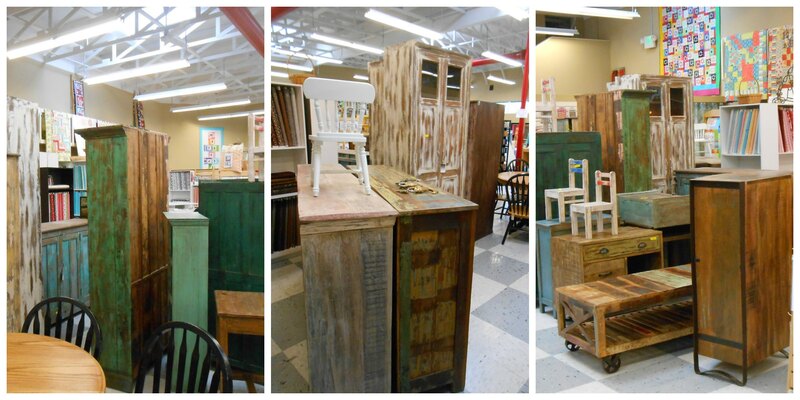 Did you know that all of our furniture throughout the store is available for purchase? If you’re interested in a piece, just stop at the front counter and ask to see the furniture pricing book. If something catches your eye, though, act fast! Several pieces have already sold and are in their new homes.